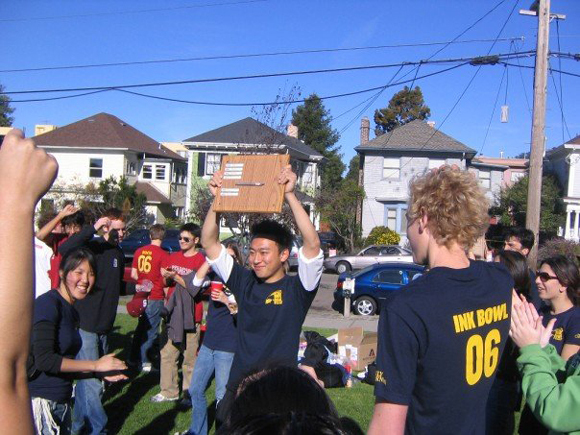 The Daily Californian  held onto the prized Exacto knife for yet another year as it beat The Stanford Daily  in the annual Ink Bowl this past Saturday. Coach Gerald Nicdao led the Daily Cal to a 32-28 victory that featured some offensive fireworks.The Ink Bowl is a flag football game between the staffs of the Berkeley and Stanford school newspapers on the morning of the Big Game. An Exacto knife is given to the winner of the game. The Ink Bowl is a tradition dating back to at least 1970. We wish we could tell you when exactly it all started or the all-time wins and losses, but record keeping for the Ink Bowl is a tad shoddy.Prior to the game, Andrew Willis unveiled an impressive outfit featuring a pink headband and matching knee-high pink socks. In a post-game interview he revealed that it was to raise awareness for breast cancer .On the field, Jack Ross quarterbacked the Daily Cal to a quick lead that would never be seriously threatened. Matt Kawahara burned his man deep on two occasions for scores forcing The Stanford Daily’s safety to fall back in double coverage. Steven Dunst also came up big with a score (might have been two scores) and finished with an original victory dance that will from now on simply be known as “The Dunst.”Kevin Leahy and Andrew Kim both added touchdown receptions to make an insurmountable lead for the Daily Cal. Leahy’s touchdown was marked by an ugly incident in which a frustrated Stanfurdite tackled him on his way into the end zone. Being the class act that he is, Leahy marched off the field with a laugh.While on defense, Berkeley students made sure to put forward a strong effort. Editor-in-chief Stephen Chen made a huge play on fourth down: rushing the quarterback and tipping the pass to force a turnover on downs.At halftime with The Daily Cal confidently in the lead, Steffi Chan gave a rousing speech to keep the troops motivated. It started with two claps, then the words “all right,” followed by silence. The underlying message of the speech was clear—Chan was not satisfied with the current output and expected more out of the staff.The second half was highlighted by a key interception at the hands of Allyse Bacharach to put The Stanford Daily in a tough position. On the next Stanford Daily possession Jimmy Tran almost came down with a miraculous interception reminiscent of Antonio Cromartie’s grab  but could not hold on. His play did, however, save another touchdown and sealed the win.At the end of the game Peter Byrne came back in as quarterback. Bryne suffered a hamstring injury during the first possession but stayed loose on the sidelines in case he was needed. After completing a long pass, he was carried down the field  by Mustafa Shaikh in what was game’s most touching moment.As has become tradition, the Ink Bowl was preceeded by a relay race. The Daily Cal fell behind early in the race but managed to win by a split second with a superb effort (you might call it cheating) by Bryan Thomas. A tiebreaker was held to settle the disputed result with the two editor-in-chiefs going head-to-head. Nick Parker, The Stanford Daily’s editor-in-chief, stunned everyone with an amazing time to salvage some pride for the Stanfurdites.After the race, Steffi Chan was handed the Exacto knife and hoisted the trophy above her head to cheers of “WE’VE GOT THE KNIFE, WE’VE GOT THE KNIFE!” And so once again the Daily Cal brings home the most cherished trophy in the history of all college newspaper flag football rivalries.As a note, we apologize if someone was incorrectly credited with a touchdown. The Cal athletics department forgot to send a stat-keeper, and as such, several memories have been pieced together for this account.